You all know our family LOVES nature study. We are inspired by the colors, the patterns, the design of the many amazing things around us. The family oriented DVD, The Life and Journey of the Amazing Monarch Butterfly, feeds our passions. It is a feast for the eyes as well as the heart. Even for families that have already studied monarchs and have raised them from caterpillars, you will learn so many awesome details that you will not look at a monarch butterfly the same…ever. Have you seen a female actually lay an egg and know how she picks a milkweed to deposit it on? Have you watched the caterpillar shed its final skin and eyes? Do you have a picture in your mind of where the monarchs migrate to in Mexico and why we should care about their forests? Do you truly understand why we should not view milkweed as weeds and remove it from our gardens? Did you know you could tell a male from a female quite easily once you know what to look for? This DVD will take you deeper and farther than your normal butterfly study could ever dream of doing. You will be encouraged to tell others about the wonder of God’s design and wisdom. You will be determined to nurture milkweed in your neighborhood. You will ignite a desire in your children to be a part of citizen science through the Monarch Watch and tagging program. This DVD will reach your heart. Remarkable video and images of each stage of the monarch’s life cycle: egg, caterpillar, chrysalis, and adult. You will see footage of things humans rarely get to see and your children are going to be amazed at the incredible close-ups that show the intricate workings of this butterfly. The information is interesting to all ages. After watching this DVD, I heard little monarch facts being sharing among family members and with friends as well. There is enough detail for older children yet the animation and “story” make it appropriate for younger ones as well.. I was impressed with the creation focus done on a clearly scientific topic, just the way I try to present nature study in our family. Details from scientists, direct observations, and experts draw attention to the amazing design of the monarch. In addition, I appreciate that this DVD was a family production including all ages and abilities. The Crowe family provides a great example to other homeschooling families with their diligence. 60 minutes long. In addition, approximately 45 minutes of bonus features. $19.95 (see special offer below). The bonus features are not to be missed. 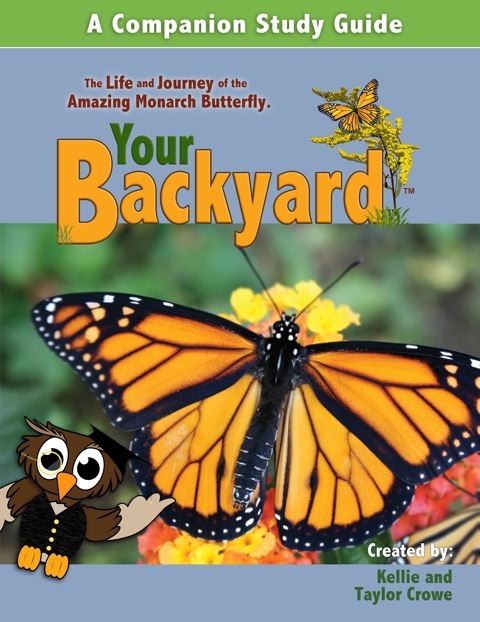 You will learn how to raise your own backyard monarchs, use extra websites for research, complete a fun follow-up quiz, and see behind the scenes information your family will find inspirational. With the companion study guide this DVD could be the basis of a whole unit study for homeschoolers. Companion Study Guide Coming Mid-Spring! The Crowe family is in the process of writing a complete companion study guide to go along with this DVD. This downloadable guide will include: content review, discussion questions, diagrams to label, sketching suggestions, essay questions, copy work and coloring pages for a variety of ages, and ideas for further research. I know our family will be looking forward to using this as part of our nature study this spring and summer as the opportunity arises. The study guide is scheduled to be released mid-spring and will cost $8.95. As part of this review, I am thrilled to offer you the chance to purchase this DVD with a coupon code to receive the downloadable companion study guide FREE! Also, with the coupon code, you will receive the DVD at a discounted price of $18.95. This offer ends on February 3, 2012. Please note: I received this DVD and the giveaway copy in exchange for a review. I always give my honest opinion and share our family’s experiences when reviewing a product. I also will receive a small affiliate commission if you purchase the DVD using the coupon code listed above. How exciting! I would love to have this resource. I love nature studies, and monarch butterflies are especially interesting to me and my family. Thanks for offering. I haven’t seen milkweed growing in our neighborhood, but we have seen monarch butterflies migrating through. Thanks for the great offer! This resource looks amazing! I haven’t seen milkweed in our neighborhood. I am not sure if we have milkweed in our neighborhood…but we do see monarchs passing through from time to time :). I would love to win this resource too! We love nature studies! I think we were going to grow milkweed in our yard at one point, we just didn’t do our due diligence and keep it watered. My neighbor has some! This looks like a fantastic resource! My 5 year old adores Monarch butterflies. I haven’t seen milkweed in our neighborhood, but I have seen Monarchs so I know it’s out there somewhere! This dvd looks so cool! Yes we have milkweed and it’s our favorite plant to watch in the spring… It’s usually covered either with caterpillars or butterflies. Thanks for offering this great giveaway! We grow milkweed in our Panhandle of FL. backyard just for the Monarchs. Each year we have the joy of watching God’s miracle take place in the lives of “our” Monarchs! We then share seeds with our neighbors (by accident) and friends (on purpose). This looks like it would be a great addition to our monarch life cycle lessons. Thanks for doing a give away. Let the milkweed grow in 2 different gardens in the yard. One is set up as a butterfly garden. The other is along open dairy fields. Looks like a great resource – I loved to have this in my home! I just recently heard about this new DVD. We love their other DVD on birds and look forward to this one. BTW, I have never seen milkweed in our neighborhood, but saw it often growing up. This looks great! We will be studying butterflies in the spring. Thanks for the giveaway. I haven’t noticed milkweed in our area, but we recently moved and haven’t had a chance to fully explore our new surroundings! I don’t think we have milkweed here either. I would love to win this. We were able to grow some milkweed last summer and hopefully it will come back larger this year and attract more Monarchs. looks like a fun resource! This looks great and my little nature lover would enjoy it for sure. Thanks for the chance to win. That looks like an awesome giveaway. We have never seen milkweed in our area but always on the lookout for it where ever we go. We have milkweed, but so far have not seen any monarchs on it. We had milkweed in our old neighborhood but have recently moved. I’m planning to plant some this spring in our new butterfly garden! We haven’t been able to locate milkweed in our area but will continue to look for it. I commented hours ago and the little box did not reload- still not able to get it to. We love the Bird DVD and would love this one too! We do NOT have any milkweed in our neighborhood and it is on my list of things to plant this spring. I have not seen milkweed in our neighborhood, but we will be on the lookout!! Thank you for sharing this DVD! I love butterflies, esp. monarchs! I have never noticed milkweed growing in our neighborhood, probably because I haven’t known what to look for. The children and I have a “butterfly garden” and we have contemplated adding milkweed but know it can be invasive. A family we knew gave us monarch chrysalis’ to watch a few years ago because they have loads of milkweed and get a lot of monarchs on it. It was so fun to have the monarch butterflies emerge and then release them but we were never able to “catch” them in the act! The kids and I would love to win this!!! I would love to win this resource to share with my four wee scientists! As for Milkweed. Hmmm. I don’t know if we have it. Guess I’ll need to do that Outdoor Challenge of yours, eh. Well, regarding the milkweed…hmmm….I’m not sure. I *might* be interested in growing some from seed as long as it wasn’t something invasive. Definitely worth checking into! Hmm, I don’t know what milkweed is! I guess I need this DVD! Very exciting!!!! We are studying butterflies this summer. What a wonderful companion this would be. Yes, we actually had milkweed in our yard this past summer and fall. We didn’t know what it was until we were watching videos of butterflies on Youtube and discovered what the pretty weed was growing in our yard! My son has since then tried to save any milkweed he sees, and makes sure that he tells Daddy not to mow it over so we can have Monarchs in out yard! I love your blog. We would love to win the DVD. We’ve found milkweed at a park nearby. This video would be a great compliment to our upcoming unit study on butterflies.